Is Jesus Christ for or against His followers’ celebrating Christmas? If you think that is a strange question, what He taught may surprise you! One of the most prominent days on the Christian calendar is Dec. 25—Christmas. At this season of the year, mainstream Christians around the world celebrate the birth of Jesus Christ. Even though the holiday is named after Christ (the Mass of Christ) and supposedly honors His birth, over time the day has been commercialized and is now widely celebrated by many who don’t even profess Christianity. But doesn’t Jesus Christ appreciate the Christmas celebration and feel honored by it? You may assume the answer is obvious—how could Christ not love Christmas? It’s His birthday, right? It’s a celebration to His glory, right? 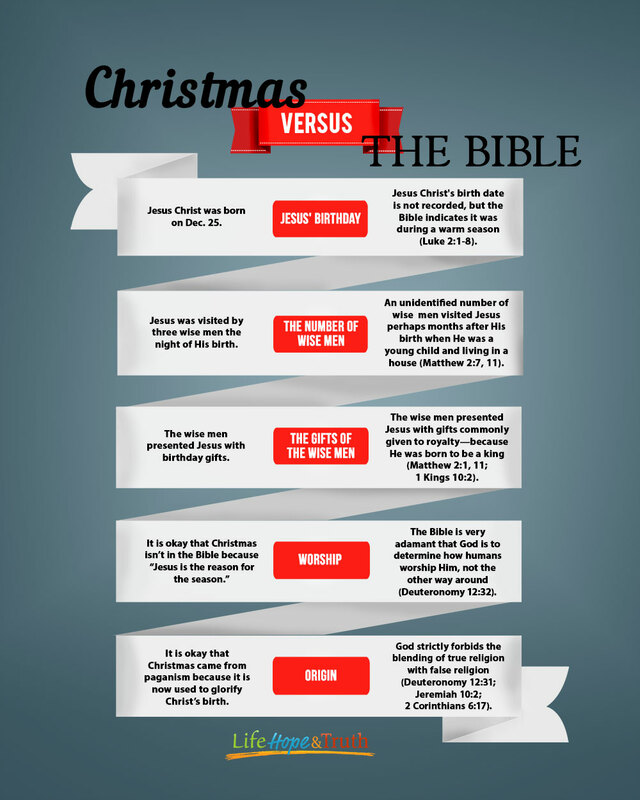 Well, before you close this article and go on with your life, please consider some facts about Christmas. 1. Nobody in the Bible ever kept Christmas. 2. Jesus Christ’s birthday is unknown. Not only is any hint of a celebration of Christ’s birth absent from the New Testament, but the Bible is also strikingly silent when it comes to the actual date of His birth. The most detailed account of Christ’s birth is found in Luke 2. Here we find that at the time of Jesus’ birth a census was taking place and shepherds were “living out in the fields, keeping watch over their flock by night” (Luke 2:1-8). Because of the rainy and cold weather in Judea during the winter months, this would not have been a good time to take a census. Furthermore, shepherds typically sheltered their flocks at night during the cold winter months. Though Luke 2:1-8 doesn’t give us specifics, it does establish that Jesus’ birth was not in winter. The fact is that God purposefully did not record the exact time of Christ’s birth. Nowhere in the Gospel accounts does Jesus reveal His birthday or ask people to celebrate it! Neither do we get any hint that the original apostles celebrated it after His death, resurrection and ascension. 3. The Roman church allowed new converts to retain elements of their pagan festivals in the new celebration they called Christmas. The celebration of Christmas did not enter Christianity until many years after the end of the biblical record (the Bible closes in the last years of the first century). Historians trace the beginning of Christmas to the fourth century—about 250 years after the close of the New Testament era. The World Book Encyclopedia tells us, “In 354 AD, Bishop Liberius of Rome ordered the people to celebrate [Christ’s birth] on December 25” (1966, Vol. 3, p. 416). This is one of the earliest records of Dec. 25 being connected with Jesus’ birth. Saturnalia was an annual seven-day festival to the god Saturn, celebrated from Dec. 17-23. Dies Natalis Solis Invicti (the birthday of the unconquered sun god) was celebrated on Dec. 25. The birthday of Mithra, a Persian god who was primarily worshipped by Roman soldiers throughout the Roman Empire, was also celebrated Dec. 25. All of these observances were connected to the astronomical winter solstice, which takes place in late December in the northern hemisphere. This is the shortest day of the year in the northern hemisphere, and it is when the length of daylight begins to increase again. Pagans who worshipped nature saw this as the birth of the sun god. When Rome appropriated Christianity and began spreading it throughout the empire, leaders found it convenient to try to Christianize previously pagan traditions in order to make it easier for the people to accept Roman Christianity. Notice this insightful quote from historian Rodney Stark: “Paganism never fully died out in Europe; it was assimilated by Christianity. For example, many pagan festivals continued to be celebrated and many of the gods lingered under very thin Christian overlays” (The Triumph of Christianity, 2011, p. 185). This helps explain why nearly all of the traditions that surround Christmas have some connection to pagan worship of nonexistent gods. Historical research shows that this includes customs such as Christmas trees, mistletoe, gift giving, caroling, wreaths and Santa Claus. Since Christmas in its present form did not exist in Christ’s time, He never directly addressed it. But He did address it in principle. In Mark 7 Jesus Christ had to deal with false religious ideas of the Pharisees (a sect of Judaism). The Pharisees were guilty of adding burdensome religious requirements above and beyond what was found written in the Bible. Over the centuries they had developed their own unbiblical traditions and presented those traditions as proper worship of God. To make matters worse, they were also neglecting to teach and do things that actually were commanded in the Scriptures! Jesus Christ’s response to this was very powerful and direct. The principles Christ laid out also apply to the Christmas holiday. “Well did Isaiah prophesy of you hypocrites, as it is written: ‘This people honors Me with their lips, but their heart is far from Me. And in vain they worship Me, teaching as doctrines the commandments of men’” (Mark 7:6-7). In other words, God is only interested in worship that is clearly based on what He instructs in His Word—the Bible. In the Pharisees’ case, they added extra regulations above and beyond the commandments of the Bible. Christmas is also added. It’s a worship tradition added to the Bible, disconnected from God’s pattern of worship. Christmas even goes one step further! Instead of just being made up, it was taken straight from pagan sun worship. Again, the Pharisees neglected some of what God said to do and instead made up their own traditions. The Christmas holiday does essentially the same thing. The weekly Sabbath day, which God specifically commanded to be observed on the seventh day of the week—from sunset Friday to sunset Saturday (Genesis 2:1-3; Exodus 20:8-11; Mark 2:27-28; Luke 4:16). The annual holy days that God declared were His feasts (Leviticus 23; Matthew 26:17; John 7:2, 10-14; 1 Corinthians 5:7-8). If you celebrate Christmas, think about this deeply: Are you observing unbiblical, pagan traditions while neglecting some of the actual commandments of God? The question really comes down to this: Whom and what will we follow? On one side, we have the traditions and practices added by the Roman church to make their version of Christianity more acceptable to the pagan masses. On the other side, we have the teachings of Jesus Christ, who explicitly taught fidelity to worship and beliefs grounded in the Bible (Matthew 4:4; Mark 7:7-13). So, it truly is Jesus Christ vs. Christmas. Christmas is a worship tradition added to the Bible, disconnected from God’s pattern of worship. Previous PostPrevious IS CHRISTMAS IN THE BIBLE ?